IMPORTANT! 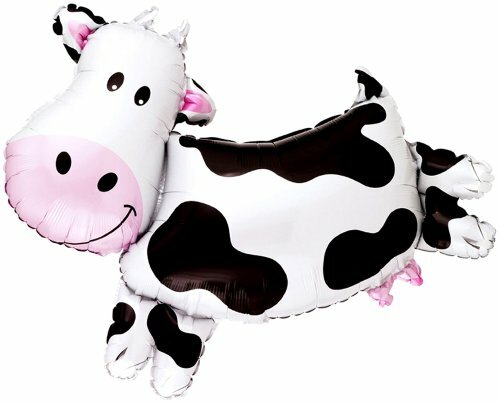 This cute 30" Cow is a FANTASTIC NEW ANTI-GRAVITY HOVERING TOY! These balloons are NOT TIED TO A STRING! Fantastic Floatables Revolutionary new Zero-Gravity Toys are the most AMAZING balloons you've ever seen! Not only do they provide an completely NEW EXPERIENCE, they also offer MORE PLAY VALUE per dollar spent! . . . . . . IT'S A TOY! IT'S A DECORATION! IT'S A BALLOON! IT'S FUN! IT'S EDUCATIONAL! IT'S AMAZING! The "HIT OF THE PARTY!" 1,000 times MORE FUN than any balloon on a string! Amaze all your guests, young and old alike. They make great gifts and are excellent icebreakers. They are interactive and have many documented EDUCATIONAL and THERAPEUTIC properties that Special Needs Teachers have found to be very useful as well. They also make awesome Nerf targets. . . . . . . THE PET BALLOON THAT FOLLOWS YOU! Fantastic Floatables have an uncanny "habit" of following people due to powerful, but invisible air currents caused by the heat rising off the human body. Super Fun for Everyone! . . . . . .YOU CONTROL EXACTLY HOW HIGH THEY FLY!!! Our EXCLUSIVE "No Strings Attached" Balloon Height Control Kit allows you to easily set them to hover at any height you want. . . . . . . . HOW DO THEY WORK? Simply apply the enclosed transparent adhesive backed Neutral Buoyancy WeightPac to the balloon after inflating with Helium. Then remove the small height control Weight-tabs from the balloon until it hovers at the height you want. . . . . . .Durable. Floats 2 to 4 weeks. REFILLABLE!! HELIUM NOT INCLUDED. All Fantastic Floatables are SOLD UNINFLATED. No batteries needed. Comes complete with balloon, our (Patent Pending) Zero-G Neutral Buoyancy Balloon Height Control Kit, and easy assembly Instructions. A basic assembly instruction video is also available on Fantastic Floatables YouTube Channel. Recommended for indoor use only. . . . . . . Every Earthling Should have one. A BETTER BALLOON! A BETTER VALUE.